I love it when we study plants. 1) The kids really enjoy it. 2)Spring is upon us! YAY! I’m excited to *Spring forward* and have the sun set much later. LOVE IT. a little 8 page mini book that I forgot to grab a picture of the kids doing…. and the craftivity/writing project for the board wherein the kiddos demonstrate their knowledge of plant parts and their purposes. See those roots? It’s yarn that has little *frilly* pieces on it. It works so perfect for roots and root hairs. I picked it up at Michaels years ago. Lasts forever. There are lines on all the parts for the kiddos to write what they know about those parts and their functions. You can pick up this mini-unit at TpT . follower who comments on this post. 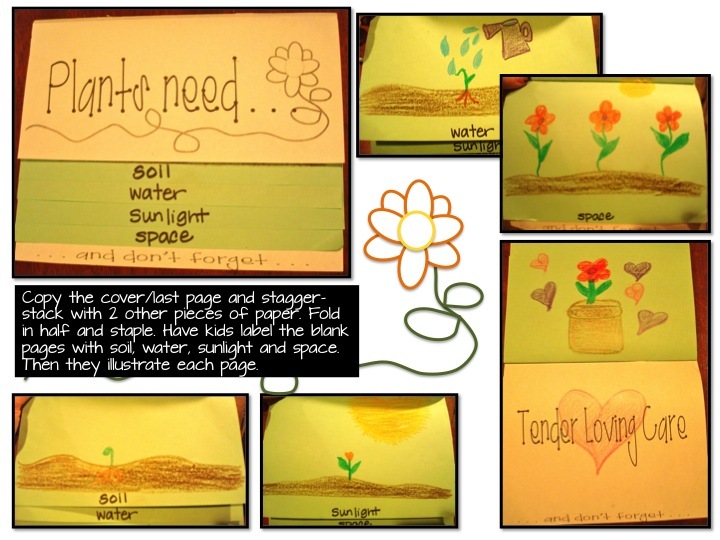 Next week we will continue our plant study and make this flip book. The 2 inside pages are just blank paper. You could use colored or white paper. Stagger all 3 pages and fold in half. Staple in the center. Click the pic for your copy. Have you linked up with Crystal from Kreative in Kinder to help support the teachers affected by the tornadoes? I can’t imagine how horrible it would be to lose everything you worked so hard to make and purchase all in a quick moment. Heartbreaking. It’s so awesome to be part of a group that is so supportive and helpful. Hopefully we all can do what it takes to get those teachers what they need to make things a bit easier. and the St. Patrick’s Day Mystery Pack from Misty over at Think, Wonder, & Teach (she has one of the most gorgeous blog designs!). Thanks to all of you for following my blog. 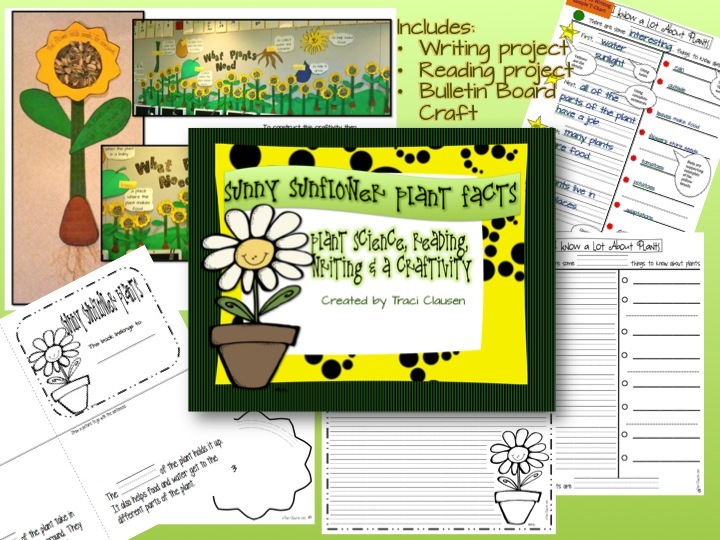 Don’t forget to leave a comment for a chance to win the Sunny Sunflower Plant Science mini-unit. I’ll do the random draw thingy on Tuesday. We study plants fourth quarter, so I've bookmarked this post. Love the seed centers of your sunflowers! I so am happy today. You just planned my plants week! Yeah. It's in my cart already so you can give it away to someone else. I love the bulletin board–so will do this! This activity looks perfect! Very creative! I love those flowers! This is adorable! Love this! We're in the middle of our plant unit right now! Thanks so much for taking the time to share this. I love how you add so much art and writing to science. I'm sure it helps the children to remember what they are learning. Your kids are lucky to have you as a teacher! Love this unit! The sunflower is my favorite as well. I also LOVE the writing activity! 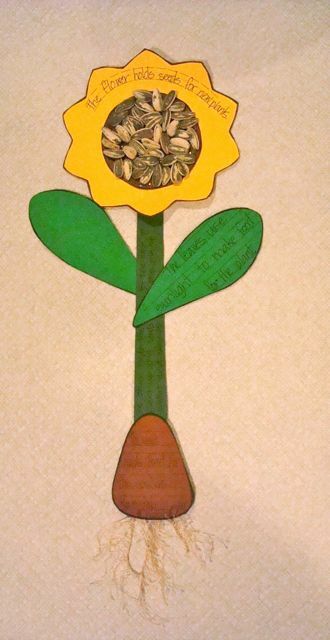 The sunflower picture above illustrates the parts of a plant beautifully! Love the sunflower!! Looks like a great unit!! What a cute display!!! We do a similar activity at the beginning of the year. You have given me ideas how I can add to it. Love the plant books too. Thank you for sharing. I love this idea!!!! I have a Sped class and they love doing hands on activities such as this!!! I live the sunflower! It's so cute! Super cute and educational. Thanks for sharing. Wow, love the sunflowers. I'm getting ready to teach plants, love the ideas! I LOVE that bulletin board! This would be a fun unit to start off Spring with! I love your spring unit! Adorable!! Thanks for the freebies – I can't wait to use them! I do my plant unit in April and I must say I love the yarn with the little frilly pieces! I am going to be on the hunt to find some. Thanks for sharing. We will be studying plants when we return from Spring break. This will go great with my Science unit. Thanks for sharing! Wow! I love this! I'm student teaching in a grade 1 class right now and I'm just about to start teaching about plants. What a great way to incorporate everything! 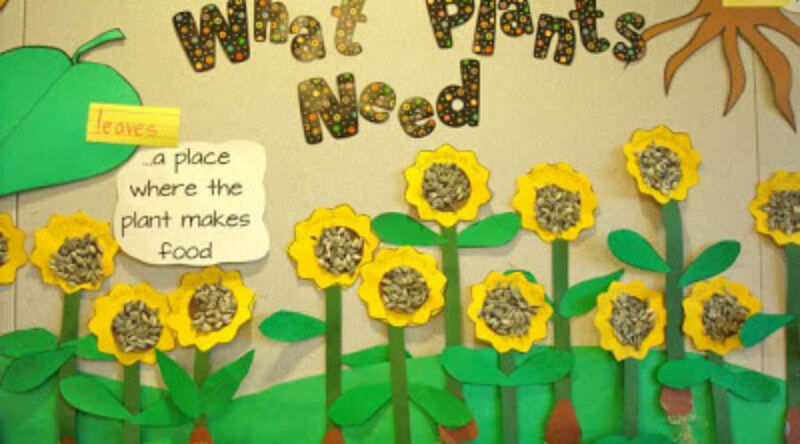 I LOVE sunflowers and I love how you have made an awesome looking unit to teach about these pretty plants. I am a new follower. Perfect timing . . . we are going to start studying plants soon! I've been waiting to actually plant our seeds until after spring break so I don't have to worry about plants drying out. This is adorable!! I love the sunflower unit. You are so creative! I am excited to be joining up with you in the giveaway! Andno judging from me…I get jealous all the time.lol! Love your unit and pictures! What a cute idea! Those super cute sunflowers just make me smile. What a cute idea and bulletin board. I'm just starting a soil unit with my kiddos!!! But I love the sunflowers! So springy and I love the freebie! I'd love to win your plants unit! WOW! You are very creative! I love your plant unit. I use Foss Science New Plants. It is kind of dry. Your unit would be a great addition to my classroom. I love your site! Have a great day! So cute! Sunflowers are my favorite. They bring about smiling….how do they do that? I love the unit. We are just getting ready to start this unit and you have given me some new inspiration. Thanks. Love your unit! We are getting ready for plants in April! LOVE LOVE LOVE your blog design! Blue and green–a great color combination. 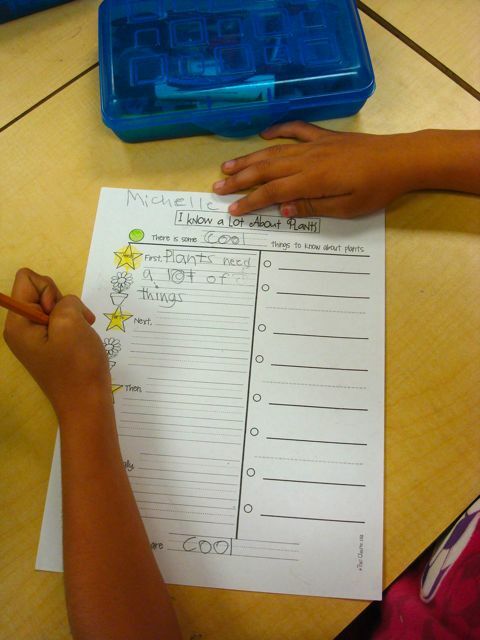 You have a lot of neat ideas here and it makes me miss being a first grade teacher. BTW, thanks for stopping by my blog earlier and leaving such a nice comment. I am now following you! Thanks so much for your sweet comment on my book recommendation tree! I LOVE your super cute sunflowers!!! What a perfect way to add color and cheer to a classroom! I purchased this mini unit yesterday, can't wait to try it out with my kids in a couple of weeks! Love your sunflower unit! It looks so cute and our next unit in science is plants! I am your newest follower! Your blog is super cute!! This is perfect for our upcoming unit!! I love the wall display and I just happen to have the perfect wall that I can put it on!!! I love your blog design and am so happy to have found your blog. I am a new follower thanks to Vicky. 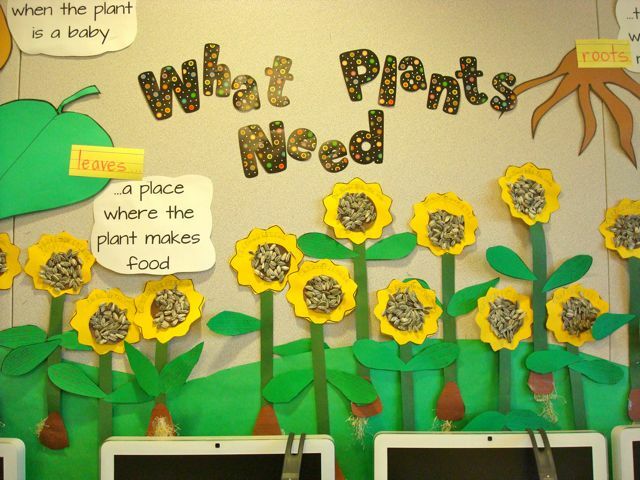 I love your bulletin board with the sunflowers! It is so neat! You've got a great bulletin board display. Its great to see some science themed ones. This unit is great. I got so many ideas. Thanks! This is so cute! I am a new follower…found you in pinterest! This is a very cute unit. Thanks for sharing your ideas. Thanks for sharing your ideas and talents!